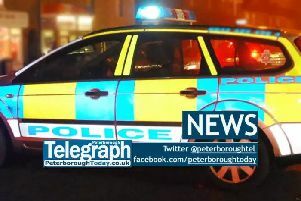 The Archbishop of Canterbury said a project to help homeless people and rough sleepers in Peterborough is one of the best he has seen in the country as he toured the city this week. The Most Rev Justin Welby was taken on a three day tour of the Diocese of Peterborough this week, with visits ranging from Queensgate to the Faizen e Madina Mosque - as well as spending time at the Cathedral. On Monday he visited The Garden House project, which is based at the Cathedral and offers help and support to the city’s homeless residents. He said: “One of the things I am very focussed on at the moment is the whole issue of homelessness and rough sleeping, because so many churches are involved in addressing this, along with other faith groups. In the Garden House you can see a profoundly Christianly motivated ministry that is unconditionally accepting, and is incredibly empowering of those who come and seek its help. “It doesn’t treat them as objects that you do things to, but as people that you do things with. 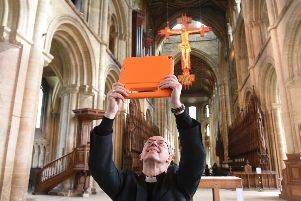 The Archbishop was at Peterborough Cathedral on Wednesday where he launched a new mobile phone app, which brings tours of the historic building to life. The augmented reality app takes visitors to a number of stops in the cathedral - and each stop triggers snippets of information about the history and purpose of the Cathedral, as well as augmented reality animations, ‘hands on’ games and puzzles. The Most Rev Welby said technology like the new app - along with the visit of the Soyuz space capsule last year - showed science and religion could mix. He said: “Soyuz was brilliant. In the middle ages they spent about as much of the GDP on cathedrals as we do on defence or health. “Cathedrals were built as the big focal points for welcome, for education, for celebration for prayer , for lamentation, for mourning, for joy, for great events. They were the centres so to put a space ship in there is totally appropriate. The Most Rev Welby also spent time at the Faizen e Madina Mosque, and with other faith leaders in Peterborough as he spoke about the importance of community cohesion and the role faith has in today’s world, with the differences Brexit has brough. He said: “Faith is about the eternal, it is about giving yourself a perspective that goes beyond what is immediately in front of us. Faith is something that gives you an eternal perspective, and therefore when you have faith groups together, of course we have differences, but in this country, more and more, the differences matter, but they are dealt with with friendship and relationship without being overlooked. Abdul Choudhuri, chairman of the Faizen e Madina Mosque said the discussion about religions working together in Peterborough was welcome. He said: “The Archbishop was welcomed by all Imams and teaching staff as well as the executive committee members of the Mosque.